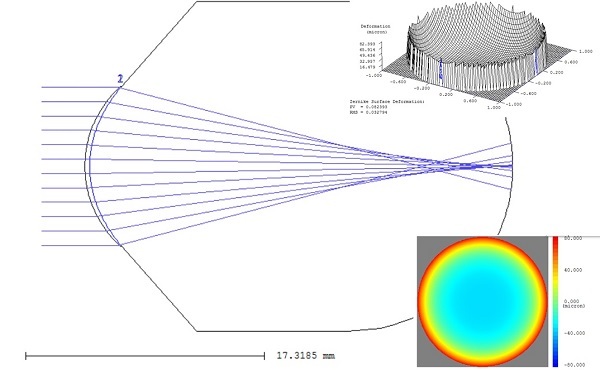 Universidad de Alicante researchers from the Group in Optics & Visual Perception (GOPV) have designed the first multifocal scleral lens for the compensation of presbyopia or tired sight. Presbycustom - as it has been called - is a highly gas-permeable contact lens with a design customised to the eye features. "We been looking for the most suitable optical combination to increase the eye's focal depth without significant deterioration of visual quality. This makes it possible to compensate for the tired or presbyopic sight that begins from the age of 45 and prevents patients from performing close-up tasks, including reading", as UA researcher David Piñero said. The main advantage provided by the lens designed by the Group in Optics & Visual Perception is a novel adaptation method that customises the eye's optical quality without the need for a complex process avoiding additional tests. "For this purpose, the optical behaviour of the presbyopic eye and its compensation have been thoroughly studied by performing thousands of optical simulations with different types of optical conditions and checking the effect at the eye’s focal depth level. Also, several clinical trials have been carried out with real patients that have allowed us to design a highly accurate algorithm", Piñero explained. "The first limitation of multifocal contact lenses to date is that the design is assumed to be valid for all patients with the same level of addition, regardless of the specific aberrometry that might be applied to eye where the lens is going to be adapted. These fixed levels are based on population average data so they work well in one group of patients but not in others. "In fact, there are users in whom not only is vision not improved with the multifocal contact lens but even it gets worse. This causes many adapters and patients to reject the use of these types of lenses", UA researcher added. On the other hand, Presbycustom presents a scleral support design, ie the lens does not rely on the cornea but the peripheral part of the eye or white part, which presents lower sensitivity, with a completely stable product that eliminates fluctuations of vision with the eye blinking. The method improves the lives of thousands of people as presbyopia or tired sight is an age-related condition that can not be prevented. Also, it is the main visual anomaly that affects people over 45 years, hence almost 100% of the adult population needs reading glasses. The project has been carried out within the context of a proof of concept funding called by the University of Alicante Office of the Vice President for Research and Knowledge Transfer, in collaboration with Lenticon Lab, in charge of the final product, manufacture and marketing.